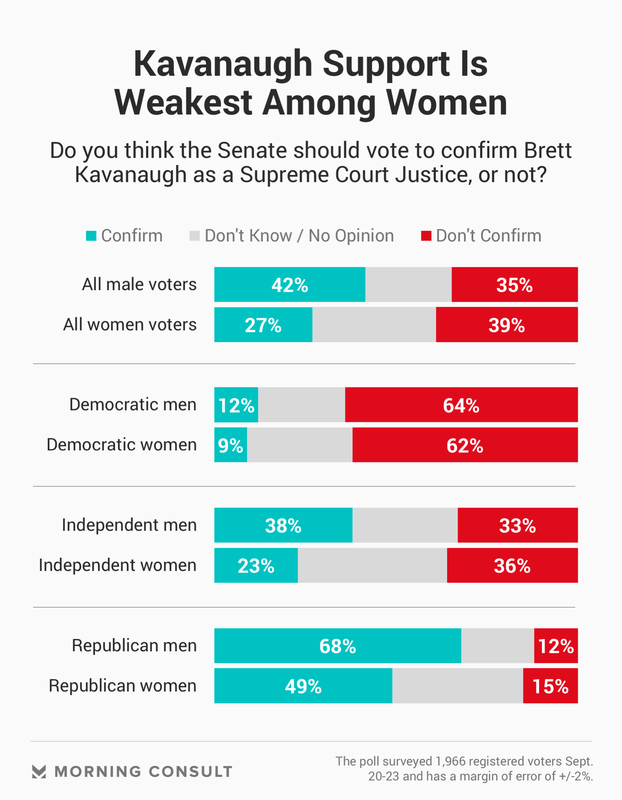 Kavanaugh’s net support drops 18 points among Republican women, with 49% thinking he should be confirmed and 15% in opposition. When it comes to Trump, net support among the same group fell 19 points, with 68% approving and 26% disapproving. Kavanaugh’s net support among Republicans — the share who oppose his confirmation subtracted from those who support it — dropped 11 points, with 58 percent now in support of his confirmation and 14 percent opposed. The shift was driven by an 18-point fall in net support among Republican women, with 49 percent now in favor and 15 percent in opposition. 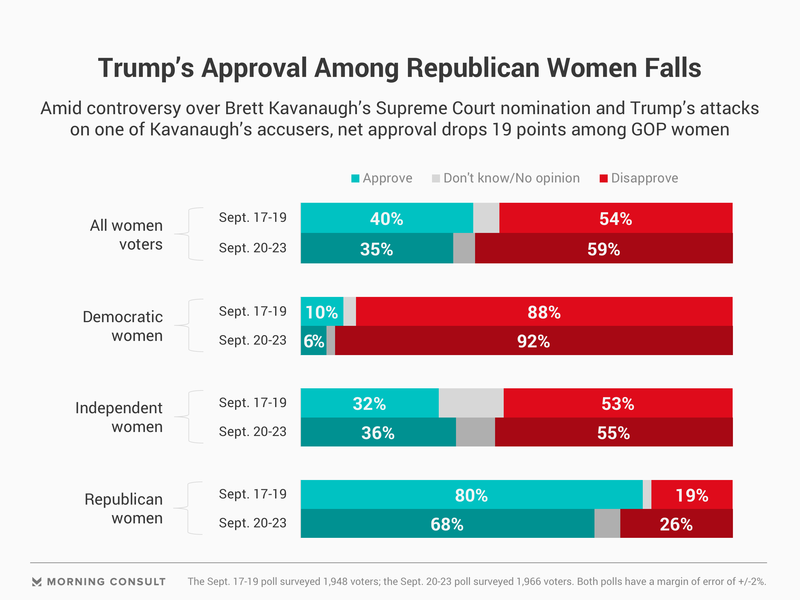 Among GOP women, the drop in net support was 19 points since last week, with 68 percent approving and 26 percent disapproving. The latest poll, which surveyed 1,966 registered voters, has a margin of error of 2 points. The poll was conducted after Kavanaugh denied Ford’s allegation, but before he participated in an interview on Fox News to defend himself, seated alongside his wife, Ashley Estes Kavanaugh. “I am not questioning and have not questioned that perhaps Dr. Ford at some point in her life was sexually assaulted by someone in some place. But what I know is I’ve never sexually assaulted anyone in high school or at any time in my life,” he told host Martha MacCallum in the interview, televised Monday. Questions remain about whether Kavanaugh has the votes he needs in the Senate, where members of the Judiciary Committee are set to take testimony from Ford during a hearing Thursday. Voters expect lawmakers to listen to her charges: Forty-four percent said the allegation should be considered by the Senate in deciding whether to confirm Kavanaugh to the Supreme Court, versus 37 percent who said it should not. Those in favor of a Senate hearing include a 46 percent plurality of women, versus 34 percent who were opposed. Men were split on the issue, 42 percent to 41 percent. Correction: A previous version of this story mischaracterized the figures pertaining to support from GOP women.